Altered Alchemy : stoked !! i was at red envelope yesterday handing sharon (the owner) 3 sets of elephant coasters :) whoot! and i was yacking away like usual and sort of twiddling some cute leather keychains by her counter. off hand i said ... "i wonder where i could find some pieces of leather"
i said "well ... i dunno yet, crafts i guess"
sharon smiled and tore out a little piece of paper, wrote an address and phone number on it and handed it to me. 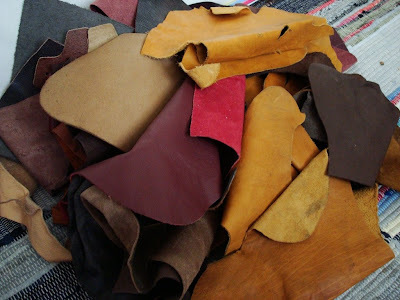 "go find my sister, she deals with leather"
i looked at her "but i only need a couple of small pieces, old ones that no one wants"
sharon said "go find my sister"
have no idea what i'm gonna do with them but i can't wait to get my hands on them :) scraps that no one wants ... i got them! i'm stoked!! Hey there, wow, all that leather - imagine mixed media paintings with leather flowers throughout - my mom gave me a heap of leather too a few months ago and I stretched it over wooden frames (like a canvas) then painted on them, they turned out really good - make sure you show us what you make with this treasure!!! Enjoy! Whatever you decide to do with them, I want to see photos! Oh how fabulous Luthien! I'm thinking books perhaps but you're SO creative I can't wait to see what you create with them!! Ooh they are lovely - all full of possibilities!! Want to see photos when you've decided what to make with them! yes, yes, yes ... mixed media! yummy!!! How wonderful Luthien!! It's amazing how just a few idle words can take you to new places! I can't wait to see what you make! !